GOOD SOAKING AHEAD: Rain becomes widespread across Alabama today; we project amounts between 1 and 2 inches statewide between now and midnight. 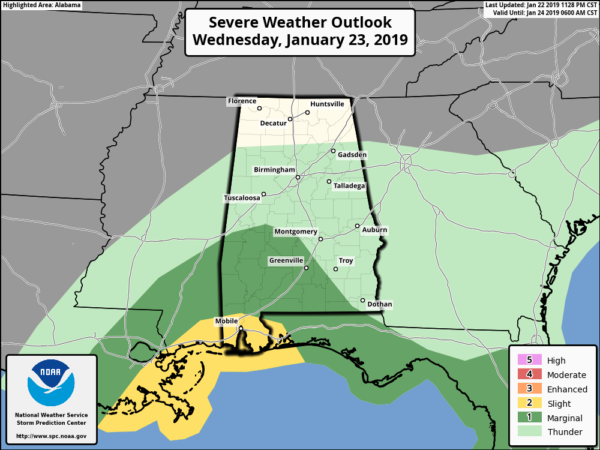 And a few strong storms are possible over the southern counties of the state; the Storm Prediction Center has defined a slight risk (level 2 out of 5) of severe storms for parts of Mobile and Baldwin counties today, with a marginal risk (level 1 of 5) as far north as Demopolis, Greenville and Geneva. Storms over far south Alabama will have the potential to produce strong winds and an isolated tornado or waterspout. The main window for the heavier storms there will come from roughly noon until 6 p.m. 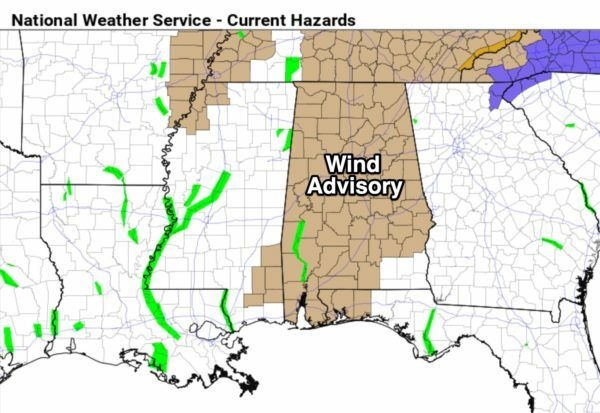 In addition, there is a wind advisory in effect today for all of Alabama, with the exception of the southeast corner of the state. Pressure gradient winds (not related to thunderstorms) out of the south will average 15 to 25 mph with higher gusts. FLURRIES? The rain ends from west to east tonight, and as colder air rushes into the state, a few light flurries are possible over north Alabama, but there will be no impact or accumulation. THURSDAY/FRIDAY: The weather both days will be cold and dry, the sky partly to mostly sunny; the high will be in the upper 40s Thursday, followed by low 40s Friday. A cold front should pass through in mostly dry fashion Thursday night, although it might squeeze out a snow flake or two in spots. Again, there will be no impact, and most places will be dry. 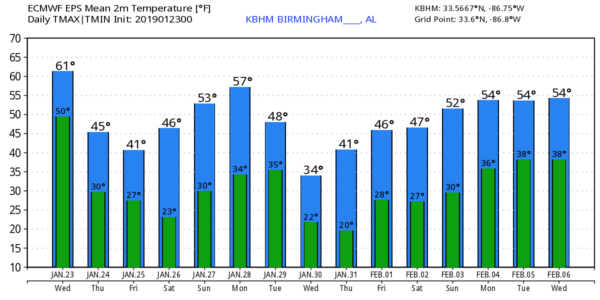 THE ALABAMA WEEKEND: Dry weather continues. Saturday morning will be cold, with a low in the 20- to 25-degree range, but we rise into the mid 50s Saturday afternoon with a mostly sunny sky. Sunday will be partly sunny with a high back in the mid 50s; a clipper-type system to the north won’t bring precipitation to the state since the air will be so dry. NEXT WEEK: Monday will be dry and pleasant with a high around 60, but an Arctic front will bring much colder air Tuesday, along with the chance of some light rain. A few flurries, or areas of light snow, are possible Tuesday in the colder air, but for now the chance of meaningful accumulation or impact looks small. Temperatures on Tuesday will likely fall into the 30s with a brisk north wind. Wednesday will be cold and dry, with a high only around 40 degrees; upper teens are possible Wednesday and Thursday mornings. No precipitation Wednesday through Friday. ON THIS DATE IN 1969: An F4 tornado cut a 120-mile-long path from Jefferson through Copiah, Simpson, Smith, Scott and Newton counties in Mississippi, killing 32 and injuring 241 others. Property damage was estimated at $2 million. An inbound Delta Airlines aircraft reported a hook echo on its scope with this storm.